The Prince of Wales Hotel overlooks Middle Waterton Lake after the first snowfall of winter. A winter wonderland picture shows the Prince of Wales Hotel opposite Mount Vimy in the distance. Designated a Canadian National Historic Site in 1995, the Prince of Wales Hotel overlooks Upper Waterton Lake on a day after the first snowfall of winter. The clouds and sky are mirrored in the calm surface of the lake and the snow pillows on the surrounding vegetation that has not yet lost its leaves. The absence of humans seems only to add to the mystery of the day. Built by the Great Northern Railway, the Prince of Wales Hotel is the only railroad hotel in Canada to be built by an American railway and is one of the largest all-wood buildings in Alberta. Prince of Wales Hotel opposite Mt Vimy and overlooking Middle Waterton Lake after the first snowfall of winter, Waterton Lakes National Park (a UNESCO World Heritage Site & Biosphere Reserve), Alberta, Canada. 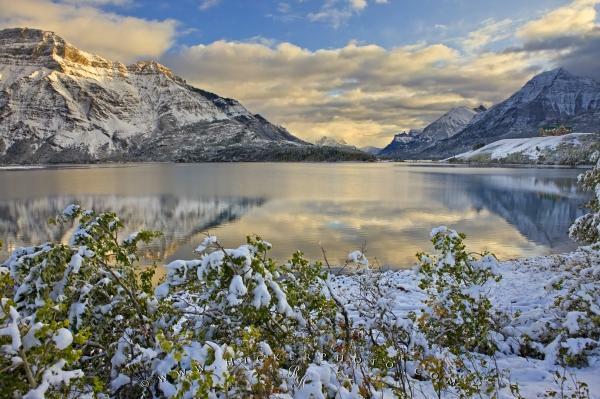 Photo overlooking the beautiful winter wonderland landscape of Waterton Lakes NP in Alberta. Pictures from photo gallery "Waterton Lakes National Park"
This picture is part of the photo album "Waterton Lakes National Park" - there are more beautiful images waiting for you.